Elizabeth Vollmer-Buhl, lives in Eugene, OR. Worked as an interpreter 1997 to 1999 (summer and winter). Liz headed the Development committee administering Crossing Portages and other fundraising efforts. Dan "Vern" Miller, lives in Elkins, AR. Worked from 2001 to 2010 as an OA Forman and Interpreter (summer and winter). Vern has headed the Service committee administering the scholarship, photo contest and staff recognition programs. Kyle Ford, lives in Coeur D Alene, ID. Worked from 2003 to 2005 as an Interpreter and was assistant Chief interpreter in 2006. Roger Dellinger, lives in Arvada, CO . Worked as an Interpreter in 1980 and 1981. Roger is currently the Charles L Sommers Alumni Association treasurer and leads the Finance Committee. Membership may nominate Active Members to include on the ballot for the election to the Board of Directors. Send the nominee name along with a biographical resume and 10 supporting signatures from Active Members by September 15th, 2018 to (the deadline has past). The spring edition of the Charles L. Sommers Alumni Association's Reflections newsletter is here! SAA members have the opportunity to volunteer as interpreters (non-paid) for crews arriving at the start of the season in June. Volunteers should understand Northern Tier policies for staff and participants. Plan on arriving the day before your crew will. This will allow you to complete training. This includes training on current policies, practices, equipment, and facilities. Registered with the Boy Scouts of America. If not registered, you can register with the BSA through Northern Tier. Completed a BSA swim test before arriving. Completed Wilderness First Aid and CPR certification. Completed online courses: Youth Protection, Safety Afloat, Safe Swim Defense, and Weather Hazards. Completed BSA Annual Health and Medical Record (within 12 months) by a healthcare provider. Those interested in volunteering should contact Leslie at 218-365-4811 for more details. Recruit Trail Staff for this Summer! 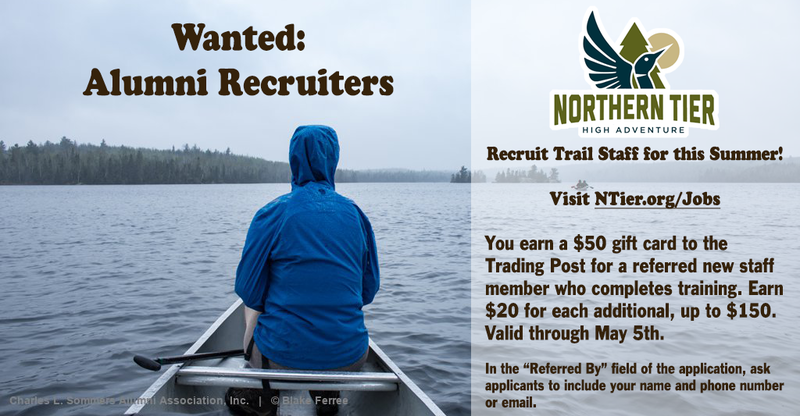 You earn a $50 gift card to the Northern Tier High Adventure Trading Post for a referred new staff member who completes training. Earn $20 for each additional, up to $150. Valid through May 5th. In the “Referred By” field of the application, ask applicants to include your name and phone number or email.